← Some great pickups – Horror, Sci Fi and Sports! 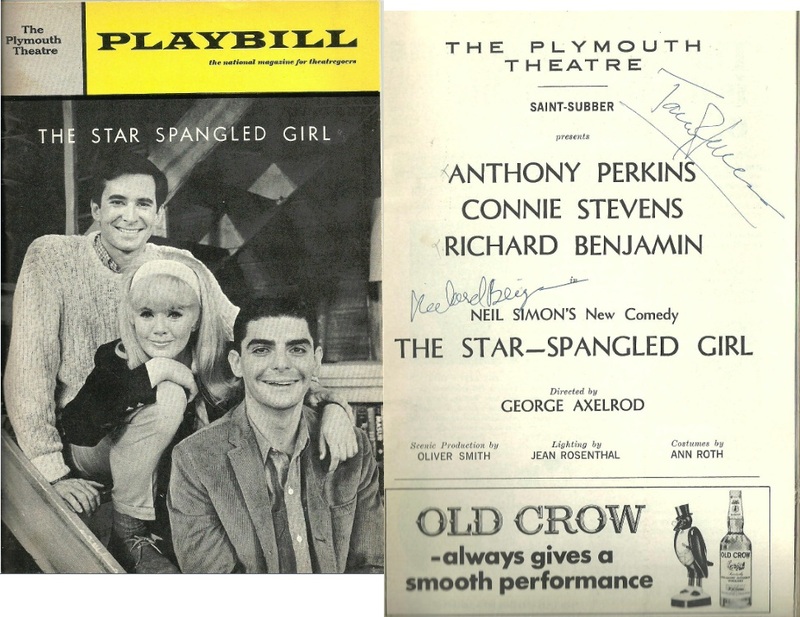 A Great Playbill from the Star Spangled Girl signed by one amazing actor in Anthony Perkins and another actor in Richard Benhamin! -Anthony Perkins is best known for playing Norman Bates in Psycho. He’s been a top want of mine for a very very long time. He also had roles in a Friendly Persuasion and some other films. Thrilled to add him at last. -Richard Benjamin also signed the playbill and is known for directing a slew of crappy movies (over 20) and being emmy nominated for his role in the Sunshine Boys. He also won a Golden Globe for The Sunshine Boys. Apollonia Vanova is best known for playing the Minutemen Silhouette in the Watchmen. It was a very very small role, limited to the opening montage to Bob Dylans “Times are a Changing” but she’s a signature I wanted to add for awhile, and i’m thrilled to make progress on my watchmen project again.